Everyday morning, after opening Srikoil the head priest and his assistant removes the Nirmalayam and hands it over to Varrier attendant along with Udayada without looking at it. The Varrier examines the dress closely and if there are signs of bleeding she sends it to Thazhamon Matham, the traditional residence of the Temple Tantri. There the lady of the house scrutinises the cloth again and confirm the menses. The Udayada after the occurrence is available for sale to the public. Usually, the high recommendation is required for this divine cloth. The sanctum is kept closed for 3 days when the Goddess gets menses. 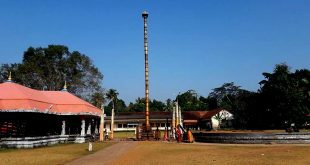 During this time, a processional deity will be installed in a room on the North-west corner of the Nalambalam. On the fourth day, the bathing ceremony Thriputarattu is conducted by taking the image in a procession on a female Elephant to the nearby Pampa river. On return, Lord Siva mounted on Elephant awaits the arrival of his consort and receives here ceremoniously. The deities then enter their respective sanctums and the Pooja process resume at the Sanctum. It is said that witness this event will be blessed with happy marriage, Progeny, Wealth and prosperity. 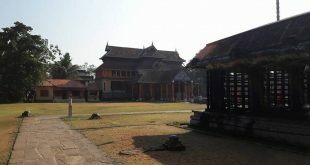 How to reach Chengannur Bhagavathy Temple? The nearest airport is at Thiruvananthapuram which is 117 km away. 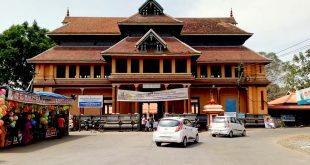 The nearest railway station is at Chenganuur which is the fourth station from Kottayam. It is 35 Km from Kottayam and falls on the Ernakulam-Quilon railway line. The nearest bus station is at Chengannur which is 1 Km from KSRTC Bus station.